I suggest merge of Player character and Rival, as well as categorisation according to the game instead of the Region. Also, I believe Pokemon Ranger characters should be added as main characters, considering that Pokemon Ranger is actually a main Pokemon Game. 3 Mentioning of Player in Mystery Dungeon? 20 Black and White Trainers? 34 Pages for Mystery Dungeon player characters? 49 Pokémon Let's Go Japanese player character names? 51 Leaf now called Green in Pokémon Let's Go? Mentioning of Player in Mystery Dungeon? Since we're not getting Kris back, as she's more a Crystal character than a GS (and by extension, HGSS) character, what should we name the new girl since we don't know her name and likely won't be getting it? I say Soul, since, like Leaf, she'll likely be named for the prefix of the secondary remake game, while her male counterpart is the primary original game (Gold, like Red) and her rival is the secondary original game (Silver, like Blue/Green). Should we make an article yet, though? I've protected both Heart and Soul until the tenth anniversary of GS, so... no need to worry there. Plus, we can move it when and if we get her real name either via hacking the games to pieces or because they actually give her one outright. But it never happened to Leaf, so... we'll just wait to see, eh? is there art of the player characters from Pokémon + Nobunaga's Ambition we could put on here? Volcronaperson 00:33, 24 March 2012 (UTC) Yes there is. Now it is on this page. Do we have a confirmed name here? It feels like you guys might be jumping the gun here. While their names might very well end up being these, there is years of precedence in the Pokemon franchise for pre-release "tentative" player names to later be scrapped altogether for the finished product. Ethan was 4'11" tall and weighed 88.2 lbs in HeartGold and SoulSilver. Lyra is 4'11" tall and weighs 90.4 lbs. Pages for Mystery Dungeon player characters? Are Sun and Moon really the official names? I read somewhere that the opposite player doesn't show up as an NPC, and we don't have either one in the anime so we can't go off of that, and the Dex Holders in Pokémon Adventures are always named after the games, so that's not good either... I think we should discuss it a bit before we decide their names. And the search for ヨウ and ミヅキ in Google will also find plenty of pictures. I think this is different from Calem and Serena's case, since the Japanese version is called X/Y and the US version is called Xavier/Yvonne. The names Sun and Moon are not "unofficial"; the names were used officially throughout the pre-release period. Two years ago, another member (Tester) suggested above that we list the player characters like this. I updated the table with Sun and Moon, and would like to suggest it as well. I think it looks better than the current set-up. The image of all the player characters does not include the versions of Sun and Moon from Ultra Sun and Ultra Moon. Before, it was only pre-release material. Now, Figma is using Selene as the name of their Pokemon figure. It's licensed products now. But this isn't even my main point. My main point is the Japanese names. Serena and Callem were named Xavier and Yvonne in pre-release. Brendan and May were named Orlando and Anna in the ORAS demo. 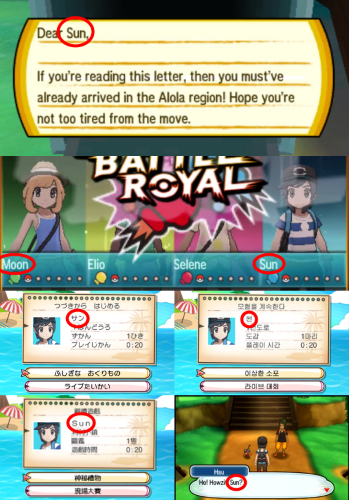 Ellio and Selene are named Sun and Moon in the SM demo. But whenever those names appeared, what was used in the Japanese version of the trailers and demos? If LGP/LGE are indeed a split remake of Yellow (and thus, timeline alternates to RB/FRLG), then the male PC would be a new (somewhat younger) version of Red while the female PC would be either a new (younger) version of “Leaf” or a brand-new girl (just like Lyra replaced “Kris” when Pokémon Gold and Silver Versions, along with elements from Pokémon Crystal Version, were remade into Pokémon HeartGold and SoulSilver Versions), while the rival would be a redesigned Blue. If, on the other hand, LGP/LGE are a “sequel” to the RBY/FRLG narrative, then the two protagonists (and the rival) would have to be brand-new characters with brand-new names. The edit summary kind of says it already. Red Ethan Brendan Lucas Hilbert Nate Calem Elio ?????? Kris* May Leaf Dawn Lyra Hilda Rosa Serena Selene ?????? Multiple users and I have been having a bit of a war on the page. Those against putting down Chase and Elaine keep asking for sources, but they have been CONFIRMED to be those names during multiple livestreams. Today, I finally sourced Elaine. Pokémon Let's Go Japanese player character names? I'm just as confused as you. Blue appears to already be famous, which means that Red and Blue might literally just be "Battle Legends", they fought in the league and are the best. The game seems to be a reality where all three exist, with Green's personality taking inspiration from her manga counterpart in the Pokemon Adventures Series; though that version also starts donning Leaf's outfit after the FRLG manga series. I noticed one of his Water Shoes was missing a two-pixel-wide chunk, which I found detached between Calem's legs, so I reattached it. I'm not really a fan of things that always need updating. ...I guess that kind of describes the whole wiki, but I mean that the problem is that that image is not entirely easy to update. Plus, as more keep getting added, it just becomes worse as an actual thumbnail with more and more characters crowding the same limited space.